Yesterday we hosted the Developing Older Dogs Seminar, and the reaction to Sally’s talk on your options when facing the final goodbye to your dog, means I thought it might be helpful to share Cooper’s last few days, and the choices we made. If you would also like to share your story then please do so. Cooper was diagnosed with an aggressive cancer, that had spread to secondary tumours in his lymph nodes, a few days after our summer holiday. He had a marvellous summer – one of his favourite things was to sunbathe and he had plenty of opportunities this year. Our holiday was also perfect; the only shadow being the lumps we found in his neck while we were there. As he was otherwise, apparently, fit and well, playful and happy, we decided not to get them investigated while we were in France but waited so his lovely regular vet could check him out. We braced ourselves for a diagnosis of lymphoma – something which may have given us a few more months at least. The truth, that we were facing weeks at most, was almost devastating. We didn’t know how long we’d have, but when your vet only gives you three weeks worth of tablets then you know it isn’t long. There were times during those next few days when it almost felt like I’d never be able to breath again. Cooper was my special boy, my favourite (it’s Ok to have favourites); I thought he would have several more years before having to face this. I cried myself to sleep on several occasions, while planning all the things I wanted to squeeze in to his final few days while he was still well enough. For the first week, I was sometimes able to persuade myself we could have months. 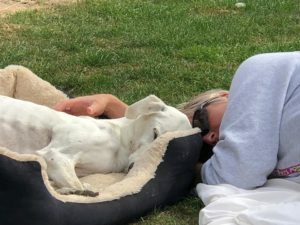 He didn’t seem any different – playing with the younger dogs, enjoying his walks – but gradually he slowed down, his breathing became more laboured, and 10 days after his diagnosis he slumped. Suddenly we couldn’t control his pain and he was miserable. Frantic email to the vet – because I couldn’t talk without sobbing on the phone – and we had a plan to increase his meds to block his pain. But on that Saturday morning I knew his time was short. We took him to the beach; it was a glorious day and we have some amazing photos to treasure from that day. He got a burger in the pub for his dinner. The following day we took him away for the night, leaving the others with a friend to look after, and it was there we agreed that his time had come. He got steak in the restaurant, cooked breakfast the following morning, and spoiled by everyone he met. He managed a short walk on the beach the next morning – still greeting strangers with his trademark grin and lapping up the attention. We came home, special friends came to say goodbye and then we wrapped ourselves up for his final 24 hours. He had been a big part of lots of people’s lives, but we didn’t want to share him any more. While we were away we had planned what would happen. We asked our vets Johnson and Scott Ltd – Veterinary Clinic to come to the house to put him to sleep. We planned that we would keep his body at home, and take him to be cremated privately the following day. It was important to me that I took care of him, even after he’d gone. His final day was a warm and sunny. He pottered in the field and the garden, he slept (accompanied by the two youngsters who seemed to know he wasn’t his usual self), and spent the afternoon in the garden asleep on his bed. We shut the younger dogs away so that when the vet arrived it remained peaceful and calm. Cooper got up to greet him, but then went back to his bed. When your dog is put to sleep, the vet will shave a small portion of skin so the needle goes in cleanly. As they slowly administer the drug, your dog will slip away. There may be some involuntary movement, but your dog won’t feel anything. Their eyes stay open; they may urinate or defecate as muscles relax. We believe that their hearing is the last thing to go, so we cuddled him as he slipped away, and told him what a gorgeous and handsome boy he was, and that it was OK to go. Afterwards we sobbed, and sobbed. Riley had watched much of what was going on, but didn’t want to investigate his body at all. When the vet had left, and we were ready, we let the younger dogs out. They came racing out to where Cooper was lying, apparently asleep in his bed. Buzz hesitated as he approached, and curved round him, taking a few moments to check him out. Woody, on the other hand, ran straight up, stood on Cooper’s body, and shoved his face in to Paddy’s face. He knew instantly that Cooper wasn’t Cooper any more; he would never have done that while he was alive. Even in that moment of pure grief, I was able to marvel at a dog’s ability to read another dog. Cooper stayed at home, lying on a bed, covered with a blanket but with his head out because I couldn’t bare to cover it, until I took him to be cremated the following day. I checked on him several times that night. He gradually went stiff, cold to the touch, and started to smell. Small amounts of blood escaped from his mouth, and urine soaked the towel we’d placed between his legs. The crematorium was calm and peaceful. I took him first thing in the morning and knew they would take care of his final moments. He was lifted on to a table alongside the incinerator and I kissed him one last time. When I collected his ashes 3 hours later, they were still warm. He’s now home. I still cry for him most days; there’s a huge hole where he used to be. I am getting used to working without him, and Buzz is stepping up to do Cooper’s jobs differently, but successfully. The dogs are settling down, without the great white goof joining in when the youngsters play. Riley is a bit unsettled and wants to come along for the ride when we go out when previously she’d have preferred to stay home. But we’re getting there, in our own way. We were lucky; we got time to plan. And we did what felt right for us. It doesn’t matter what you do; everyone is different. If you can, decide now what you want to do when it happens. You can always change your mind, and circumstances may force it on you, but exploring the options means you face fewer decisions at a time when the world is spinning and it feels like it’s going on without you.